1st, Annas Graeme of Inchbrakie, Wife of George Smythe or Rapness and secondly wife to Sir Robert Moray Knight of Abercairny. Annas Graeme’s marriage is not likely to be lost in obscurity. By numerous documents dated from 1653 to 1659 we are reminded of it. Black Pate settled a very handsome dower on his eldest daughter; 6000 merks was a large sum, and owing to the heavy demands of the late war, it was arranged by the contract of marriage that it should be paid in three instalments of 2000 merks each during the years 1654, 1655 and 1656. The contract is between Andrew Smythe and his son George Smythe of Rapness, Orkney; and Annas Graeme, lawful daughter to Patrick Graeme younger of Inchbrakie; and his father, George of Inchbrakie, 19th August 1653. It is signed G. Smith of Rapness, and witnessed by David Graeme of Gorthie, James Drummond of Milnab, and Patrick Smythe, younger of Braco. Further, there is a document showing that to pay the dower at the stated periods, Black Pate borrowed from his brother-in-law, David, Lord Maddertie, 4000 merks on the "hail Landis of Inchbrakie and Tulliebelton." James, the master of Rollo, and Robert Graeme of Cairdney are cautioners for Black Pate, and the deed is signed at Aberuthven on the 15th and 19th February 1655, the witnesses being Robert Grahame, son to John Graeme, minister at Ochterarder, David Stewart of Innerdunning, and one or two others. In 1655 David, Lord Maddertie, for the "love and favor he bears and caries" to Anna Graeme, "my nephay, spouse to George Smythe of Rapness" with consent of Patrick Graeme makes a reversion of that 4000 merks to Anna; this had the effect for a time of releasing Patrick’s shoulders of that burden, and we find the original bond in the Charter Chest of Inchbrakie. The Solicitor-General, James Graeme, was a witness to the deed of reversion. Annas Graeme and her husband George Smythe, had two daughters, the elder of these in after years married Sir William Keith of Ludquhairn and the younger Mr William Leith. George Smythe of Rapness, Annas’ bridegroom (cousin to Smythe of Braco) was educated at St Andrews where his brother and cousins of Braco also were educated, and letters from him to Pat.Smythe afterwards of Methven, are in the Methven Charter Chest dated 1650. There is a memorandum amongst the Methven Papers of some articles purchased for Black Pate, but no price of them is given; a pound of ginger, sugar candy, nails, calomel, flour, shoes for a woman and for "bairnes" a hat "with ane taftie lining for your head with silk hat band conform." What would we not give to see this hat, no doubt a French one brought over to Orkney in some ship of merchandise! George Smythe of Rapness died, and left Annas Graeme a widow previous to 1667; she probably returned to her father’s house from Orkney, for the education of her two little girls. There she met frequently her second husband, Sir Robert Moray of Abercairney. Inchbrakie’s and Abercairney’s houses lying on the edges of their respective properties were only a quarter of a mile apart; there can be no question, Annas was a most bewitching lady of great spirit, and Sir Robert married her 12th April 1667. A discharge from him and Annas Graeme or Smythe, states (with regard to the 4000 merks which Lord Maddertie had lent Black Pate and afterwards gave in reversion to Annas Graeme, his niece) this bond had been delivered to Patrick Graeme of Inchbrakie, father of the said Annas "in custodie for her use and utility," dated 24th February 1655. And now the said Sir Robert Moray with the consent of Annas Graeme frees and releases the said Patrick Graeme of Inchbrakie and his heirs, etc, for ever, dated at Aberuthven, April 1667, before Sir Robert Nairne of Strathord, Senator of the College of Justice, and Mr John Nairne of Muckersie. This bond bears the handwriting of the two Nairnes as well as those of Sir Robert Moray (who signs himself R. Abercairny) and Annas Graeme. This matter gave great trouble later on; why it should have done so is difficult to say, for apparently the above discharge and quittance was lying in the charter chest at Inchbrakie. In July 1674 a case is instituted by Sir Robert against young George Graeme of Inchbrakie (Black Pate’s eldest son), the Lords of Session give it against George, deciding that he must pay the 4000 merks and 300 pounds penalty or in default submit "horning and poynding" in fifteen days, and George, holding out, there is a writ issued against him in 1674 in the name of the king, to escheat his movables and lands, unless he pays Sir Robert the sum mentioned. In this document it is mentioned that Robert’s marriage with Annas Graeme took place on 12th April 1667. The result of all this is found in another paper dated May 1675, Abercairny grants a full discharge to George Graeme of the 4000 merks 8th May 1675. The following tribute from an unsigned admirer cannot fail to be of interest to the descendants of Anna Graeme. "Sir Robert Moray of Abercairny was married to Annas, daughter to that valiant and loyal gentleman Patrick Graeme of Inchbrakie, remowned for his great achievements in the Great Montrose wars for King Charles the first. "This lady was of admirable beauty, high mettle, great and strict virtue, wise, frugal and religious; she kept her family affairs in great and good order all the days of her life, and was a mighty support to her husband in all his misfortunes; in short, as she bore him fine children to hand his memory down to generations to come, so she had a great share in the preservation of the small reversion, as was left unsold and unmortgaged of his estate. William, his successor, who inherited his parents’ gift of preserving the estates, which he freed from debt; he married Miss Elizabeth Graeme of Balgowan, and their daughter Elizabeth married David Graeme of Abernyte, son to the Solicitor General, and their granddaughters were Lady Rollo of Duncrub, Mrs Seaton, wife of Colonel Seaton, the respresentative of the Earls of Dunfermline; and Mrs George Drummond of Blair Drummond. Robert, a strong adherent (like his cousin Graeme, Captain of the Town Guard) of King James II. Anna, married to David Graham of Fintray. Emilia, married to James Graeme of Garvock. Amongst the quaint records of the Lyon Court we find the funeral escutcheon of Annas Graeme, daughter of Black Pate and Dame of Sir Robert Moray, she died in May 1699. Unfortunately, these interesting tables are often incorect. I give the above as it stands in the Lyon Court. The figures give the corrections, as far as lies in my powers. 7. John, tenth of Fordell. Though no written tribute of the "excellent virtues" of this lady has been handed down to us as in the case of her elder sister Anna, she was a remarkable character, as her history relates, and the portrait given of her shows her to have been of pleasing appearance. Margaret Graeme is a figure in the county history of Scotland as ancestress of the noble house of Nairne, and the grandmother of the girls who carried on the line of seven of the prominent families in Scotland. Indeed, both the daughters of Black Pate seem to have shared largely the beauty of their mother the Honourable Jean Drummond, and the brave and energetic spirit of the Earls Marichall, so conspicuously shown in the Earl’s grand-daughter and Black Pate’s mother, Margaret Keith. Passing through the great troubles of 1645 to 1660, Margaret Graeme had been through the fire of an experience worse even than that of her father and grandmother, though as a child she had shared the troubles of the "ladies older and younger of Inchbrakie." For at least seven years she was separated from her fiancé by his imprisonment in the Tower for his devotion to the royal cause; and that same Tower of London was her bridal home during the first three years of their wedded life! It must be acknowledged that her spirit and "high mettle" was at least equal to that of her sister the "Lady Abercairny". Her husband, Robert Nairne’s descent was good; it dated from the reign of Robert III, and his own high qualities added largely to the luster of his family. The fourth Nairne in descent obtained from James V the charter of Muckersie, and with his wife Margaret Oliphant came a large right of fishing on the Tay to him and his heirs male. The seventh Nairne in line obtained the charter of Ochtergaven, and the ninth (Robert) was the husband of Margaret Graeme and the first Lord Nairne; he was the eldest son of Mr Robert Nairne of Strathord, by Margaret, daughter of Sir John Preston of Penecuick. The picturesque old timbered fronted house, where Lord Nairne’s father and mother were married, stood in the High Street of Edinburgh, one of the most perfect speciments of the old French style of the sixteenth century. It was built just after the burning of Edinburgh in 1544. The owner, Mr John Preston, in 1581, though a baker, was also an eminent lawyer; he was knighted by King James and raised to the bench in 1594 as Lord Fentonbarns, and died President of the Court in 1616, having attained great wealth. in the reign of Charles II. Mr Robert Nairne studied for the law and took his degree; after a period of devotion to his profession he threw aside his pen and gown and buckled on the sword, wearing the cload of the cavalier instead of the lawyer. Scotland was in the labour of her great troubles, and shw was to find no stauncher friend in the cause of the Royal Stuarts than Robert Nairne. In 1649, Campbell of Lawers, an officer of Argyll’s gives a roll call of the "estates" of participators in Montrose’s wars, a long list of nobles and gentlemen amongst whom are Tossachs, Graemes and Drummonds (and the "Laird of Strathurd younger"), who are to be fined. The Parliament of the Estates is a debtor to Campbell for 4000 pounds; they grant half the above fines to Campbell in payment of the debt, the other half to be used as public money. Robert was born about 1620, and entered as an advocate in 1644. He attracted no special attention towards himself from the Parliament party until after Montrose’s departure from Scotland; one of his last meetings with his future bride must have been at the coronation of Charles II at Scone (near Perth), where all the nobility and gentry of Scotland attended to pay homage to their King, and where there must have been many whispered words, and perhaps a measure trod together where eyes would venture to express words, and feelings too bold for words. Then in January 1651 came the levy of the troops for the King and Robert Nairne worked hard in the cause; a meeting was arranged by night to secure privacy, and many of the gallants of Scotland rode forth at the appointed hour to meet at Alyth, near Perth. It was however Alyth near Perth that Robert Nairne rode to that August night, when a strong party of English horse suddenly surrounded the group of Royalists and bore them captive to the South, where for ten years they were confined to the Tower of London until released by the restoration of Charles II. Under those gloomy portals Margaret Graeme passed to sign her marriage contract in the presence of her future spouse in 1657, when he dowered his bride with the lands of Auchtergaven; there the ceremony must have taken place, and there, in the dingy rooms, with deep embrasured windows obscured by their heavy bars, Margaret remained after the "witnesses" and her friends had departed one by one to doff her wedding robes and make a new and brighter imprisonment for the man she loved so well and so deeply that she never gave a thought to the wise fair lands of Inchbrakie left behind, but brightened with her girlish presence and the lilting of their Scottish ballads and their hero Montrose’s songs, the tedious hours of the gloomy jail. No light task for a girl over whose husband’s head was hovering the sword of death, which fell on more than one of his friends! Then came the Restoration and the Light! Gay, gallant, happy, generous, laughing Charles was home again; the prison doors were opened wide and the birds had taken wing back to bonny Scotland, to its fair straths and laughing rivers and to its guardian hills! Surely that brave, unselfish discipline made Baroness Nairne fit mate for the founding of a race of men as the Lords Nairne and Strathallan and the Jacobite Laird younger of Gask in the ’45, for the continuing of such noble houses as Lansdowne and Dunmore, and of heroes like the gallant Keiths; while her woman’s softer influence showed in Margaret and Carolina Oliphant of Gask, the descendants who both returned to nest in the old homes of Margaret Graeme; the former as wife of the eighth Laird of Inchbrakie, the latter, the sweet songstress of Scotland, was married to the fifth Lord Nairne. In 1669, twelve years after her most romantic marriage, Margaret is a proud and happy mother by the birth of a little daughter and great rejoicings must have taken place when on the 16th October Mr Laurie, the Dean of Edinburgh, baptizes the baby girl as Margaret (no other name could equal that in the ears of Sir Robert Nairne) and if there was not to be a son, the little daughter must have all the honours of the godfathers, and next day, "17th October 1669, Sir Robert Nairne of Strathord, Senator of the College of Justice, registers the name of his and Dame Margaret Graeme’s daughter and the witness" are John, Earl of Atholl, James, Earl of Perth, and Dr Henry Henderson. The following December he makes all straight and clear for his little heiress, and his lands are made into one charter and called the Barony of Strathord in Sir Robert’s name. Sir Robert’s income was increasing rapidly and he was growing rich in lands and money and in the favour of his king and countrymen. Dame Margaret Graeme, Lady Strathord, must share in it, and he "dispones" to her "Lady Strathord in lyfrent" not only the lands of her marriage contract "Ochtergaven", but "Anewonachie, Bleloch, Logie-bridge, Kassidey, Ledmore, Belmacollie, Milu and Miln lands in the Barony of Strathord and Insturvie. In 1681, Sir Robert Nairne receives a precept clare constat of the Nairne lands of Muchersie, dated April 28th, and two days later his little girl is dowered with an annual income of 1200 merks, charged partly on lands of Inchbrakie (her mother’s tocher) and partly on the Barony of Strathford. In 1681 Robert Nairne reaches his ambition and is created a Peer as Baron Nairne, and all his lands are converted under a fresh charter to himself, under "Title and Dignity of Baron Nairn on January 27th, 1681" From its ratification is confirmed the date of his and Margaret Graeme’s marriage (10th January 1657). This meaning of the charter of 27th January 1681 has not hitherto been clearly explained in genealogical notices; in many of which it is stated that the Barony was settled on Lord William Murray, son to the first Maquis of Atholl, failing heirs male of Lord Nairne’s body. This is an error; the MS register of the Great Seal,which through the kindness of the sub-curator, Mr John Anderson, I have seen, states that the title of Baron Nairne is granted to Sir Robert Nairne of Strathord and the "airs male" of his body,which failing, to Margaret Nairne, his only lawful daughter, and to heirs male to be lawfully pro-created between her and Lord George Murray, youngest son to the Marquis of Atholl, or to any other son to whom she may be married. This charter was no doubt in consequence of a contract of marriage made in 1676 (five years previous to Lord Nairne being granted his patent of nobility). The baby heiress was but seven years old, and the contract was between her and Lord George, and failing him to "his immediate elder brother and so upward". Why such a contract was formed is not clear; the present Duke states that the Atholls "had been on the wrong side", and one can but suppose that it was for the purpose of binding the allegiance of that noble race more firmly to the throne – a hope they nobly fulfilled hereafter. The prospect of the alliance appears to have given great satisfaction to the Atholl family; the eldest son, Lord Murray, writes to his mother, the Marchioness, dated April 1676, mentioning the news of the contract, which he had heard at St Andrews, saying he was "mightielie surprised at it, "but", as my Aunt says, "I wish the rest of my brothers no worse luck". A very different fate awaited the poor little Lord George, who was but three years old when this contract was drawn up; he became the victim of bad health and the marriage was abandoned. Lord Nairne was served heir to his father in the lands of Easter Greenyard, and other lands in Stirling on 21 February 1683. Lord Nairne’s success created jealousy and when the Parliamentary party were defeated regarding Argyll’s conviction in 1681, Woodrow expresses himself strongly on the matter "being very old and infirm he (Lord Nairne) had long been unable to perform the duties of Lord Ordinary in the outer house in turn with his brother judges, and on the occasion in question" (trial of the Earl of Argyll, 12 December 1681) " was forced from fatigue to retire to bed while the pleadings on the relevancy were still going on. "The judges being however equally divided and the Duke of Queensberry who presided as Justice General being unwilling to vote, it became necessary to send for Lord Nairne; he was accordingly "raised out of bed and carried into Court where the pleadings were read over to him by a Clerk"; he fell asleep again while this useless ceremony was performing, but being awakened, voted for the relevancy of the indictment." The above statement by Woodrow appears of a party nature and somewhat exaggerated; we are told that Lord Nairne was born about 1620; he was therefore little over sixty years of age at this time; it was his son-in-law who was excused from attending Parliament, June 1693 (Act of Parliament. Margaret Nairne in 1683 was served heir to her father and acquired the same year the lands of Rogertoune (March 30th). Her father was dead and she succeeded as Baroness Nairne in her own right; Lord Murray appears to have expressed a wish that the original terms of the contract of 1676 be carried out, and that his brother, Lord William, be accepted as the Baroness Nairne’s husband, pressing some alteration or addition. A letter from the widowed Baroness, Margaret Graeme, points to this; she is writing to Lord Murray. Dowager Lady Nairne to Lord Murray. My Lord, I have ever had so high ane esteem for your Lordship that I could not have thought that ye should a been the hindrer of this affair which your Lordship was the first proponderer of to me. I use to blame my Lord Marques for several things but in this I doe not, for I am sure it is the information your Lordship sent up that made my Lord make any alteration and noat put his hand to so just a paper as that was which was drawn by your Lordship consent and the rest of your friends when they were here. I spoke to every one of them and all of them said to me it was rightly and rationally done, and persuaded us your Lordship could say nothing against it; but how ane other paper comes to be drawen up with things worded in it, that is not in the first contacts and causes tending to the outer ruining of this family if they should fal out, I know not, but, before I condishend, I rather I not my daughter had never been in it, for the friends say if I yield to this it is certainly ruined, nether doo I think any coult aske us to doo it, but they that desires this affair to be broaken up; surely if it be I am not to blame, for I have suffered more trouble to gett this interest to on of my Lord Marquess’ family than all that ever I suffered on earth, and it is well known I could have settled my daughter long agoe and goten conditions far better than are asked if it had not been for waiting on your Lordship family. I will not say what the wronge methods was, taken with my Lord George has broght him to, but I wish there may not be wronge ones taken with my Lord Wlm, who is a person of very much worth, and on who I have a very high esteem for; and I know it will trouble him if this business goe back, and if we wer not so happie as to get his Lordship we shall never have on of the family. My Lord, I beg pardon for this long and I believe troublesome letter, but I am a proud Graeme and loves not to be slighted and not tell it, but, whatever becomes of this affair, I shall wish all happiness to your Lordships family and shall ever be my Lord your Lordship most faithful and very humble servant. I and my daughter begs pardon to give our most humble services to my Lady and both of us to your Lordship. Lord Murray, afterwards the first Duke, was pulling the reins too tightly, possible over the legal arrangements. Margaret Graeme’s spirit is roused and the "Pride of the Graeme" also; she will keep to the original bargain or have none of it. Lord William Murray has won her heart and that of the young Baroness, as a staunch Royalist, and as such he may have his bride in spite of the fact that the Dowager Lady Nairne could have settled her daughter long ago and with better conditions; the pride (and may we add the straightforwardness)of the Graeme, which was no less strong now than centuries before, has won! The disagreement of the elders is overcome and the young people’s contract of marriage is signed in the September of 1690. John, third Lord Nairne, engaged in the 1715 with his father and again in the 1745; after Culloden, he sailed for Sweden in company with the Oliphants of Gask and many others; as already stated the beautiful house of Nairne was razed to the ground; its old belfry given to the town of Perth, is seen crowning King James the Sixth Hospital. The "Bell Tree" still remains (1869) near the former site of the house; it marks the spot where Lord Nairne marshaled his followers the day they set out to join their Prince in 1715. John married Catherine, third daughter of the first Earl of Dunmore; he died in France 1770, leaving male issue which ended in the son of Caroline Oliphant (the Poetess) who married her cousin Lord Nairne. Robert Nairne killed at Culloden; he had married the heiress of Aldie; she died in 1749, and their son, Colonel William Mercer of Aldie and Meiklour, married Margaret Murray, heiress of Pitkeathly, and died at Meiklour, 19 January 1790. They left three daughters; Jane married on 9th April 1787 to George Keith Elphinstone, Admiral of the Blue and created Viscount Keith; the Barony of Keith descended to their only child Margaret, who married Count Flahaut; a daughter was born in 1819. On the death of the last Lord Nairne (only son of Caroline Oliphant) the songstress of Scotland) this lady became the Baroness Nairne in her own right; she married in 1843 the fourth Marquis of Lonsdown and the title of Baron Nairne is now vested in that noble family in the person of the present and fifth Marquis. Also represented the ancient Earldom of Perth. Prisoner to Edinburgh Castle, 11 February 1746. Following and died at Machany 28th May 1773. Clough, Denbigh. Both have issue. Catherine, married William, third Earl of Dunmore, now represented by Charles VII, Earl of Dunmore. Marjory, married Duncan Robertson of Drumaquhain, ext. The property of the Chiefs of Robertson is owned by Mrs da Sales de la Terrier Buntine of Dunalastair. Louisa, married to David Graeme of Orchill, represented by Malcolm Graeme Esq, Colonel R.C. Graeme of Brackenhurst, Camberley and Robert Graeme Esq. Who has issue a daughter Rosa. Further detail of the very numerous descendants of Margaret Graeme, first Baroness, and Margaret Nairne, second Baroness Nairne, would be impossible to give in a small space; the above short notice may interest those now alive. The second Baroness Nairne, mother of the twelve children detailed above, died at Nairne House in 1747, aged seventy eight. The Dowager Lady of Nairne and her son John sold the estate of Redgorton to Thomas Graeme of Balgowan in 1728. Since this volume went to press this promising young officer (Nairne Stuart of Dalguise) was cut off by enteric fever when serving with the 10th Bengal Lancers in India in the spring of 1903; his cousin and heir Sir Tempest Tempest of Tonge Hall, Yorks, represents the line. This Lady Nairne (Caroline Lady Nairne) was the authoress of many famous Scotch ballads, "The Land o’ the Leal", "The Auld Hoose of Gask" etc.etc. A beautiful momument to her memory was erected in Gask grounds by her grand-nephew, Thomas Laurence Kington Oliphant, on succeeding to Gask. He died in July 1902, but his hearty welcome to his kinsfolk and to his friends of all classes will long be remembered in Strathearn. He married Dorothy Frances, daughter of the late J.Jebb, Esq, of Boston, Lincolnshire who survived her husband only four months. They left no issue. The contents of this website is the property of Inchbrakie Ltd. and is intended as a research tool for personal and academic study only. Any making of copies of the contents in part or whole or a derivative or summary of the contents for any purpose be that physical mechanical or electronic requires the written permission of the officers of Inchbrakie Ltd. The copyright to the revised text of the Book of the Graemes and Grahams by Louisa Grace Graeme as it is published here in 2015 is owned both jointly and separately by Inchbrakie Ltd and the estate of Louisa Grace Graeme and her heirs and descendants. 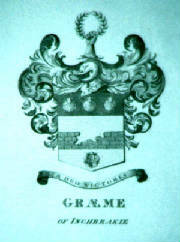 The publishing rights and copyright to the Book of the Graemes and Grahams in its original form is owned by the estate of Louisa Grace Graeme and her heirs and descendants.